Background: The most common hepatic artery complications after Liver Transplantation (LT) are hepatic artery stenosis, thrombosis and pseudoaneurysm, which can all cause ischemia in the grafted liver. As one of the main complications, the Hepatic Artery Pseudoaneurysm (HAP) is rare with the incidence of about 2%, but its consequence may be most devastating or even fatal. Methods: Here, we presented a 57 y old male patient, who underwent LT due to Hepatocellular Carcinoma (HCC), with previous history of several times of Transhepatic Arterial Chemoembolization (TACE). This patient suffered from grafted liver ischemia on the 3rd postoperative day. Initially, this case was misdiagnosed as hepatic artery thrombosis, as the hepatic arterial blood flow could not be found by Doppler ultrasound or the hepatic angiography. Subsequently, thrombolysis was adopted, which leaded to abdominal haemorrhage rather than recanalization. Immediately, the laparotomy was exploited, which showed that the ischemia was caused by HAP rather than hepatic artery thrombosis. Finally, the HAP was surgically removed and the LT was successful. Conclusion: For patients after LT, HAP should be considered when the hepatic blood flow is very low or even hardly be detected by ultrasound in particular after angiogram. Besides, HAP should also be suspected when the haemorrhage occurred during the thrombolysis but the hepatic arterial blood flow remained unimproved, especially for patient with TACE history. Nowadays, Liver Transplantation (LT) has become the standard treatment for end-stage liver diseases. Despite great advances have been achieved since the first LT in 1963, there are still several postoperative complications challenging clinicians, including vascular complications, biliary complications, rejection and disease recurrence [1,2]. The most common hepatic artery complications after LT are hepatic artery stenosis, thrombosis and pseudoaneurysm, which can all cause ischemia in the grafted liver. As one of the main complications, the Hepatic Artery Pseudoaneurysm (HAP) is rare with the incidence of about 2%, but its consequence may be most devastating or even fatal . In this research, we provide a clinical experience in earlier recognition of HAP and urgent surgical intervention to maintain blood flow to the transplant liver. A 57 y old male presented to our transplantation center with Hepatocellular Carcinoma (HCC) and liver cirrhosis secondary to Hepatitis B Virus (HBV) infection. This patient was diagnosed as HBV 26 y ago, and began taking entecavir orally 3 y ago. Besides, this patient has a history of hypertension for 3 y and takes telmisartan and betaloc tablet orally. Seven months ago, multiple masses were found in the liver, which was confirmed as HCC according to enhanced Computed Tomography (CT). From then on, several times of Transhepatic Arterial Chemoembolization (TACE) were given to this patient before being admitted to our center. According to the intensive demand from the relatives, this patient underwent orthotopic Liver Transplantation (LT) on July 21st, 2016, though the calculation of tumor number and size beyond Milan criteria. In detail, the diameter for the largest one mass was more than 12 cm confirmed by the postoperative pathology. The donor was a 37 y old male who donated his organ because of cardiac death secondary to sudden cerebral haemorrhage without any positive history. The Body Mass Index (BMI) for this donor was 26.1 and the liver function for him was normal. No variation was found in either hepatic artery or hepatic vein. The warm ischemia time was 4 min, and cold ischemia time was 445 min. The arterial anastomosis was conducted with donor celiac axis stem and recipient common hepatic artery using 7-0 Prolane in a running fashion. During the operation, the blood flow for hepatic artery was good by observation. The mean hepatic arterial blood flow rates were 31.4 cm/s and 24.4 cm/s for the 1st and 2nd postoperative day by ultrasound. However, the hepatic arterial velocity could not be checked by ultrasound on 3rd postoperative day. Then enhanced CT scan was arranged for this patient, which also showed that the blood flow was very slow. Immediately, this patient underwent hepatic arteriography. 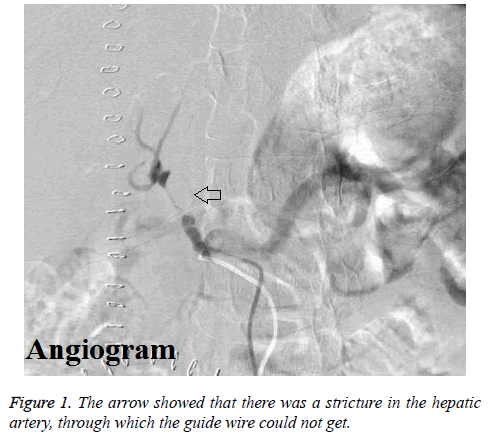 The results of hepatic angiography showed that there was stricture in the proper hepatic artery lasting for 2 cm through which the guide wire could not get, and the hepatic arterial blood flow was very low (Figure 1). Therefore, the formation of hepatic arterial thrombosis was suspected, and transcatheter hepatic arterial thrombolysis was adopted by alteplase in the night of 3rd postoperative day. Figure 1: The arrow showed that there was a stricture in the hepatic artery, through which the guide wire could not get. Unfortunately, this patient complained of abdominal pain and distension in the morning of the 4th postoperative day. Later, this patient suffered from confusion and hypotension. Meanwhile, haemoglobin decreased from 112 g/L to 92 g/L, and the peritoneal fluid was unable to condense by diagnostic abdominal puncture. Immediately, hepatic arteriography was conducted for this patient again. However, hepatic arterial blood flow could not be found during the angiography, while no contrast leakage was found either (Figure 2). 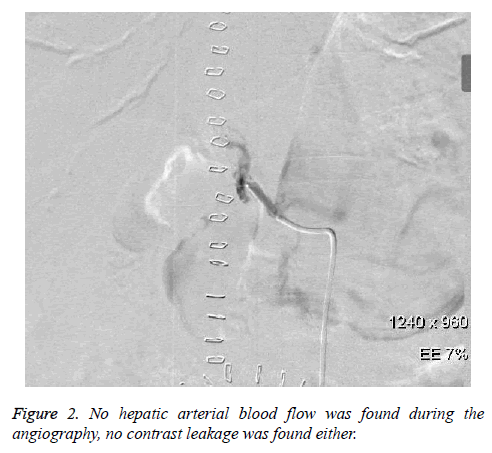 Figure 2: No hepatic arterial blood flow was found during the angiography, no contrast leakage was found either. Considering the abdominal haemorrhage, the transcatheter hepatic arterial thrombolysis could not be carried on, with the only way of laparotomy left. Subsequently, the previous incision was adopted to enter the abdominal cavity. After clearing up the blood clot, the 1st porta hepatitis was identified. We found that the donor common hepatic artery cavity was empty without thrombosis, but the recipient common hepatic artery was edema without pulse. After dissecting the previous arterial anastomosis, no blood flow but slight thrombosis was found. After the thrombosis was cleared out, the recipient common hepatic artery was found to be blocked due to arterial pseudoaneurysm (Figure 3A). Next, endomembrane rupture and pleated membrane were also found in the residual recipient common hepatic artery (Figure 3B). Finally, the recipient splenic artery was dissociated, and then be connected with the donor common hepatic artery by end-end anastomosis using 7-0 Prolane in a running fashion. In the following two days, the hepatic arterial blood flow rates were 34 cm/s and 81 cm/s respectively. After that, hepatic arterial blood flow rate was good until discharge on the 20th postoperative day, with the mean flow rate more than 20 cm/s. Figure 3: (A) The white arrow indicated the thrombosis, and the black indicated pleated membrane in the arterial pseudoaneurysm; (B) The white arrow indicated where an endomembrane rupture was in the arterial pseudoaneurysm. The most common hepatic artery complications after LT are hepatic artery stenosis, thrombosis and pseudoaneurysm, which can all cause ischemia in the grafted liver. It is reported that the incidence of Hepatic Artery Stenosis (HAS) after LT varies from 5% to 13%, and most stenosis occurred at or with few centimetres of the hepatic arterial anastomosis . By Doppler Ultrasound (DUS), the direct signs of HAS were stenosis visualization, high velocity peak (greater than 2 m/s) and turbulent flow in the pre-stenotic tract. Sometimes Multi- Detector Computed Tomographic Angiography (MDCTA) needs to be adopted when the stenosis was in extra-hepatic portion due to obesity and overlying gastrointestinal gas . Hepatic Artery Thrombosis (HAT) is also a serious complication after LT with an overall incidence varying from 2% to 9%, which significantly affects graft loss and mortality after LT . By DUS, the direct signs of HAT are without any Doppler arterial flow into the grafted liver. HAT usually presents with biliary ischemic lesions such as necrosis with biliary leakage, cholangitis, and ultimately multi-organ failure and graft dysfunction. Consequently, HAT after LT is also devastating and requires urgent revascularization. Of the artery complications, the Hepatic Artery Pseudoaneurysm (HAP) after LT is rare with the incidence of about 2%, but its consequence may be most devastating or even fatal . HAP usually occurs at the arterial anastomosis, which is often caused by infection and/or surgical defect . HAP can rupture with lethal haemorrhage, thus early identification and aggressive intervention are very essential. In 2016, we have performed 44 consecutive cases of LT, among which the ultrasound results for the first 3 d can be found in 24 patients (Table 1). After calculation, the mean hepatic arterial blood flow rates for 1st, 2nd and 3rd were 38.4 cm/s (ranging from 12 to 149), 33.6 cm/s (ranging from 10 to 98) and 35.7 cm/s (ranging from 9.4 to 165). Totally, 2 patients suffered from HAT confirmed by without arterial flow into under DUS and hepatic angiography. For this patient, we misdiagnosed it as HAT as usual, because the Doppler arterial flow could not be seen by DUS on the 3rd postoperative day. Next, thrombolysis was adopted, which leaded to abdominal haemorrhage rather than recanalization. However, the laparotomy results showed that the ischemia was caused by HAP rather than HAT. Table 1: The mean hepatic arterial blood flow (MHABF) for the first 3 d after operation in 24 patients. HAP can be classified as intrahepatic and extrahepatic according to the location. Its manifestation is not typical especially in stable period, but acute onset of abdominal pain may occur when it ruptures. The reasons leading to HAP are various, including abdominal infection, trauma, TACE, and so forth [3,8]. In our case, the HAP derived from the recipient hepatic artery. Therefore, we judged that that there may be two risks contributing the formation of HAP. On one hand, the patient received several times of TACE before liver transplantation, which may make the arterial endomembrane injured. On the other hand, we used bulldog clamp to block the recipient common hepatic arterial blood, which may also make the endomembrane injured. Treatment modalities for HAP included excision with ligation, re-transplantation, and excision with arterial reconstruction, balloon angioplasty with stenting, endovascular embolization and percutaneous thrombin injection . From this experience, we have learned the followings. Firstly, we should avoid the potential iatrogenic injury especially during the process of dealing with hepatic arteries, such as using bulldog clamp and over stretch. Secondly, bile duct anastomosis should be conducted carefully in case of bile leakage or bile duct stenosis. Thirdly, peritoneal drainage tube should be placed well, in order to drain ascites and prevent infection. Last but not the least, the spectrum of antibiotics should be managed well especially targeting the fungus, in order to prevent the infectious artery injury. In conclusion, for patients after LT, HAP should be considered when the hepatic blood flow is very low or even hardly be detected by ultrasound. Besides, HAP should also be suspected when the haemorrhage occurred during the thrombolysis but the hepatic arterial blood flow remained unimproved, especially for patient with TACE history. Harrison J, Harrison M, Doria C. Hepatic artery pseudoaneurysm following orthotopic liver transplantation: Increasing clinical suspicion for a rare but lethal pathology. Ann Transplant 2017; 22: 417-424. Idossa DW, Simonetto DA. Infectious complications and malignancies arising after liver transplantation. Anesthesiol Clin 2017; 35: 381-393. Jeng KS, Huang CC, Lin CK, Lin CC, Liang CC, Chung CS, Weng MT, Chen KH. Early detection of a hepatic artery pseudoaneurysm after liver transplantation is the determinant of survival. Transplant Proc 2016; 48: 1149-1155. Saad WE, Davies MG, Sahler L, Lee DE, Patel NC, Kitanosono T, Sasson T, Waldman DL. Hepatic artery stenosis in liver transplant recipients: primary treatment with percutaneous transluminal angioplasty. J Vasc Interv Radiol 2005; 16: 795-805. Rinaldi P, Inchingolo R, Giuliani M, Di Stasi C, De Gaetano AM, Maresca G, Bonomo L. Hepatic artery stenosis in liver transplantation: imaging and interventional treatment. Eur J Radiol 2012; 81: 1110-1115. Mourad MM, Liossis C, Gunson BK, Mergental H, Isaac J, Muiesan P, Mirza DF, Perera MT, Bramhall SR. Etiology and management of hepatic artery thrombosis after adult liver transplantation. Liver Transpl 2014; 20: 713-723. Reznichenko AA, Bondoc A, Paterno F, Shah SA. Hepatic artery pseudoaneurysm after liver transplantation. J Gastrointest Surg 2016; 20: 1405-1406. Ren X, Luo Y, Gao N, Niu H, Tang J. Common ultrasound and contrast-enhanced ultrasonography in the diagnosis of hepatic artery pseudoaneurysm after liver transplantation. Exp Ther Med 2016; 12: 1029-1033.